Since poker online is most recognized card game it has numerous techniques including bluffs. Just like in the game of casino slots, online slots the first thing which comes to mind is the reels even if its the most modern online slots software. 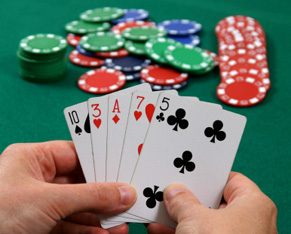 Some people are even convinced that it is impossible to win at poker both in land and online casinos without bluffing. Of course, not only this aspect is crucial in successful gambling but still it really helps. If the player never bluffs, plays only the strong hands and folds weak, he or she is predictable, thus other players can easily outsmart such player. In addition, poker bluffing helps much in poker tournaments. The popularity of poker games in general and of online poker rooms in particular resulted in the growing number of good players, that is why you can’t do without poker bluffing if your aim to win more often. There are several key elements in the bluffing which are to be considered each time you think over your poker bluffing tactic: number of the opponents at the table, the type of the players, your table image, your poker position, the cards in the postflop and the pot size. Number of the opponents. The best option for you when you want to bluff is the smallest possible number of players in the hand. The great number of opponents gives more chances that some of them has very strong hand or will call you till the very end. Of course, the more players mean, the higher pot size but still it is more difficult to cheat them. The type of the players.Watch your opponents in order to understand who of them are weak. Bad players usually call any your bet with the only aim to see your cards. Remember, that it is useless to bluff against weak players, you must be sure that you are trying to cheat the player who is ready to fold even strong hand. Your table image. Try to be as unpredictable as possible. If you always lead the loose game and play more hands than others it will be very difficult for you to apply poker bluffing. This is the psychological aspect and of course it comes mostly with experience. Anyway, try not to stick to the steady way of playing hand, try to make your play more diverse and it will be more difficult for your opponents to guess your next action. Your table position.The last position in the hand is the most favorable and desirable for bluffing. The more players have acted before you the more information you have about their hands and playing manner. Thus you have more chances to think over successful bluffing strategy. The cards in the postflop. You must learn to recognize how your opponents can benefit from the cards on the board and of course how these cards influence your hand as well. Keep in mind that the best situation is when two garbage cards and one strong for your hand card are on the board. The pot size.This is very debatable point because large pot attracts more players but it is very risky for you. Moreover, large pot provides better pot odds for other players at the table and makes it more challenging to bluff.